A pair of 2 Light Grey plastic ariels long whip antenna style can be trimmed to suit. Two provided in pack to suit cars with twin ariels or for two vehicles. 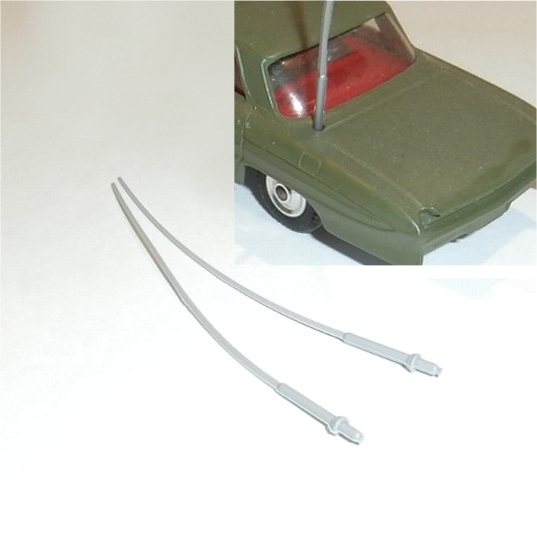 Three sizes are available: A short car radio spring base style 20mm (0.75in) long, a swept back antenna 32mm (1.25in long), and a long whip antenna 45mm (1.75in). Available in 4 different colours: White, Black, Light Grey, & Dark Silver Grey. Fit as a part of a full re-assembly of a car, the bottom of the ariel provides for this, or trim the base and install with glue to avoid dismantling the model. Suits all scale models from 1:36 to 1:48 covering most Dinky, Corgi, Spot-On, etc. and scratch building kits. The models are used for display only and are not included with this item.